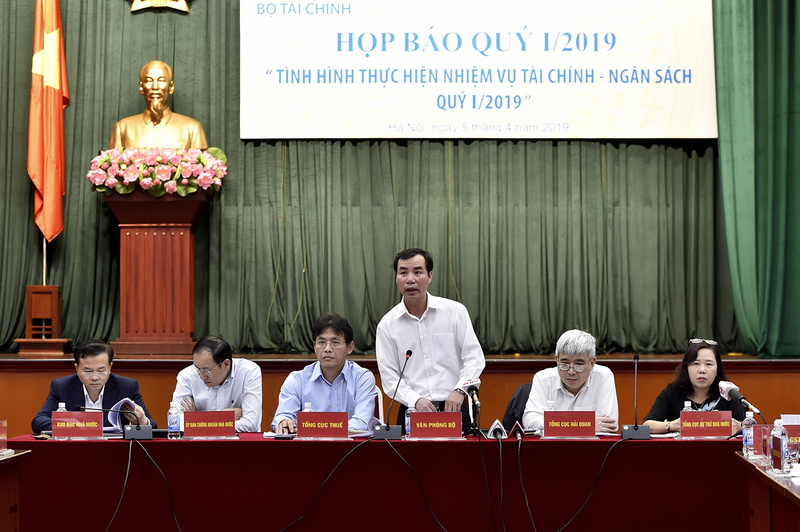 The Vietnamese government paid VND99.12 trillion (US$4.27 billion) on debt service in the first quarter of 2019, equivalent to VND1.1 trillion (US$47.44 million) per day, according to the Ministry of Finance (MoF). Overview of the meeting. Source: MoF. Upon breaking down, the government spent VND84.08 trillion (US$3.62 billion) on paying domestic debts and VND15.04 trillion (US$648.66 million) on foreign debts, said Ngo Chi Tung, MoF’s deputy chief of the Office, at a conference on April 5. Overall, state budget revenues in the January – March period reached VND381 trillion (US$16.43 billion), up 13.2% year-on-year, Tung added. Among the figures, domestic revenue for the period stood at VND315.4 trillion (US$13.6 billion), crude oil exports reached over VND12 trillion (US$517.54 million). Additionally, state budget revenue from trade activities was estimated at VND80.8 trillion (US$3.48 billion), up 17.6% year-on-year. Meanwhile, Vietnam's state budget expenditures in the first quarter totaled VND315.6 trillion (US$13.61 billion), up 7.6% year-on-year. Of the total, regular spending reached VND237.2 trillion (US$10.23 billion), up 5.3% year-on-year or 23.7% of the year’s estimate, and expenditure for development investment soared to VND46.7 trillion (US$2 billion), representing an increase of 32.4% year-on-year and equivalent to 10.9% of the year’s estimate. This resulted in a budget surplus of VND66 trillion (US$2.84 billion) in the first quarter, indicating a sharp improvement from a budget surplus of VND18.48 trillion (US$797.02 million) in the same period of 2018. Moreover, the government issued government bonds worth VND69.5 trillion (US$3 billion) to cover principal repayments with maturity terms averaging 12.35 years and interest rate of 4.91% per annum.